The Chinese Pavilion is a 19th century historic sight whose exact date of construction is unknown. 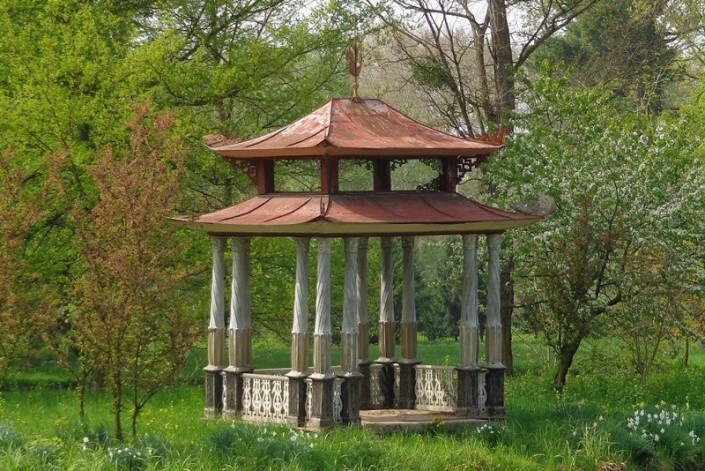 It follows on the tradition of Chinese culture inspired buildings which began in the Chateau Garden in the early 18th century. Among them, the Pavilion is unique in many ways – by its wholeness, the original design and preserved scenery purity. The Pavilion is endangered mainly by the aging of the wooden and metal structures, the stuccoes and the instability of the island banks. The island has been repaired already and all necessary surveys and documentation for further works have been done. 700.000 CZK is needed for finishing the rescue. The government has run out of the funds allocated for the project and the Pavilion doesn’t have much time left. We want to be faster than the merciless ravages of time and are thus helping to raise funds for the rescue of one of the most beautiful park scenes in this country.